If you are looking to become a certified Open Water scuba diver but you do not quite have enough time for the full certification course, the PADI Scuba Diver Certification just might be the perfect in-between for you! This course works as a lead-up to the full Open Water certification. The course can be completed in just a day and a half, and you will learn the basics of scuba diving, and get instruction that will count towards your full PADI Open Water certification. You will be working with our amazing team of PADI-certified Bahamas dive instructors. These dive instructors have been diving the waters all over the world and have chosen Nassau Bahamas as their home base, where day in and day out we take eager dive students out to explore the beautiful dive sites off the shores of Nassau Bahamas. When you sign up for the Scuba Diver Certification, you will be learning the first few parts necessary for a full certification. You will sit with our instructors for a few hours to learn the first few parts of the Knowledge Development portion of the Open Water Course. Then, you will join your instructor in a pool to learn the first parts of your Confined Water Dives. The next day, you will get to go with your instructor on your first two “check-out” dives. Usually these take place at one shipwreck site and one coral reef site. By this point, you will be comfortable with your scuba diving gear, and your instructor will be by you the whole time to make sure you are using your gear properly. The Nassau PADI Scuba Diver course is a great way to not only introduce yourself to scuba diving, but work towards becoming a certified scuba diver yourself! 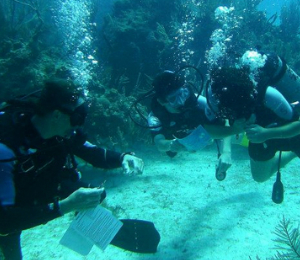 Once you become scuba certified, you can experience all kinds of amazing Bahamas scuba diving. Or you can go anywhere in the world and dive in depths of up to 60 feet! Scuba diving is a truly awesome experience and here at Scuba Dive Bahamas, we are eager to share the beauty of Nassau scuba diving with the world! I have been to the Bahamas many times, but Nassau PADI Scuba Diver Course is one of my favorite trips! It includes everything that everyone should do here. As a Bahamas veteran, I can say only the best about this experience!